Nettex Calmer Maintenance Powder contains highly bioavailable Chelated Magnesium to maintain Magnesium levels giving long-lasting effectiveness. Nettex Calmer Maintenance Powder delivers high levels of Chelated Magnesium. This is readily absorbed through the intestine to maintain magnesium levels, giving long-lasting effectiveness. 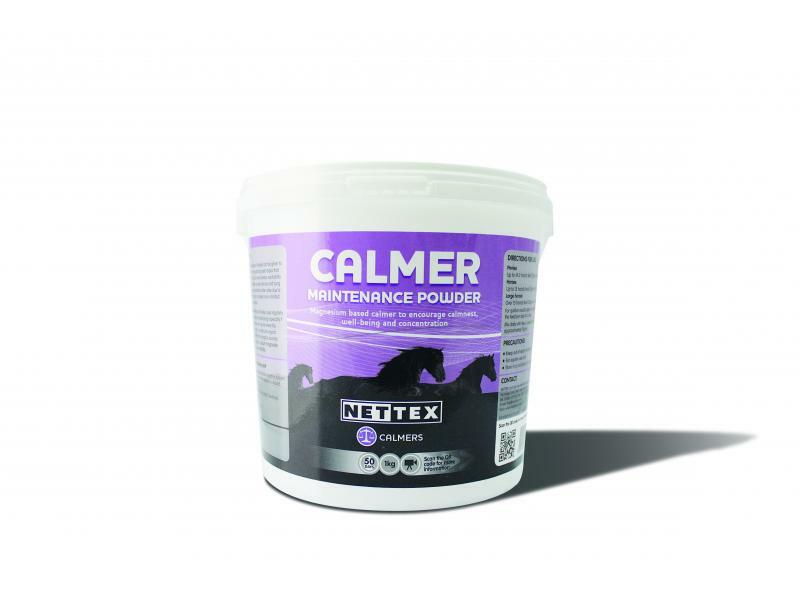 Nettex Calmer Maintenance Powder encourages wellbeing and concentration and can be fed to horses or ponies to help reduce stress related symptoms such as nervousness, excitability, apprehension and irritability. Nettex Calmer Maintenance Liquid contains Magnesium Aspartate Hydrochloride, which is highly bioavailable and considered the gold standard of magnesium, giving a rapid and prolonged effect. Nettex Calmer Maintenance Liquid delivers high levels of magnesium as Magnesium Aspartate Hydrochloride. This is the key ingredient that is considered the gold standard of magnesium. It is highly bioavailable and is quickly absorbed to help keep levels topped up within the horse’s body for long-lasting effectiveness. Nettex Calmer Maintenance Liquid also contains B vitamins to help maintain nervous system functions. It is ideal for fussy feeders who do not like powders. 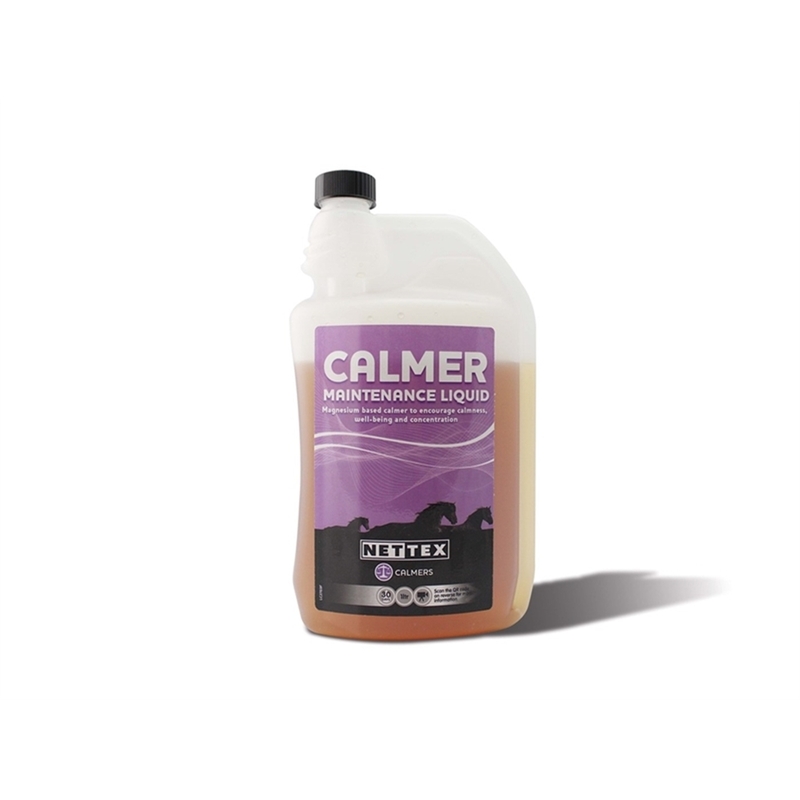 Nettex Calmer Maintenance Liquid encourages wellbeing and concentration and can be fed to horses or ponies to help reduce stress related symptoms such as nervousness, excitability, apprehension and irritability. A behavioural and travelling calmer to help in reducing stress, anxiety and aid improved concentration when a quick fix is needed. Gives your horse a winning attitude without compromising your horse’s emotional balance and personality. Nettex Calmer Syringe Paste Boost contains Magnesium Aspartate Hydrochloride and L-Theanine, an anti-stress amino acid active from green tea. It is an easy to administer syringe for when a quick fix is needed, ideal for show bag, lorry or tack room. Magnesium Aspartate Hydrochloride is considered the gold standard of magnesium. It is highly bioavailable and is quickly absorbed to help keep levels topped up within the horse’s body for long-lasting effectiveness. Nettex Calmer Syringe Paste Boost also contains B vitamins to help maintain nervous system functions. 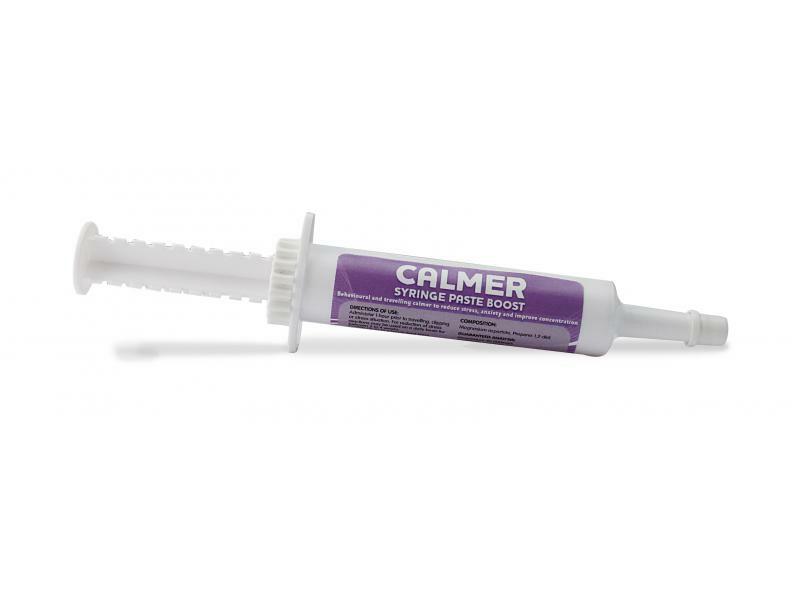 Nettex Calmer Syringe Paste Boost gives a rapid effect during times of stress, giving results within 30 minutes of administration. It is safe to use on a daily basis and helps to support improved concentration and take the edge off excitable horses. Key ingredients: Magnesium amino acid chelate. Large horses over 15hh: Feed 30g per day. For faster results feed double the rate for 5 days. Mix daily with feed. A level (20ml) scoop dispenses approximately 15g. Absorption rates can vary between horses which can affect the results of the calmer. Some horses may need a slightly higher or lower dose for desired effect. It is best advised to trial at home before a competition or stressful event so as not to leave it to the last minute and be disappointed with the outcome. Calmer supplements are most effective when used in conjunction with training and environment modification. Magnesium can often be low in feed and grazing. It is important to choose a magnesium compound that is highly bioavailable. Chelated magnesium is highly bioavailable for rapid results. Key ingredients: Magnesium Aspartate Hydrochloride, Vitamin B6, Niacin. Ponies up to 14.2hh: Feed 20ml per day. Horses up to 15hh: Feed 25ml per day. Large horses over 15hh: Feed 30ml per day. Mix daily with feed or feed orally via syringe. For faster results feed double the rate for 5 days. Magnesium can often be low in feed and grazing. It is important to choose a magnesium compound that is highly bioavailable. Magnesium Aspartate Hydrochloride is considered the gold standard of magnesium and is highly bioavailable for rapid results. Key ingredients: Magnesium Aspartate Hydrochloride, Vitamin B6, L-Theanine. Administer 1 hour prior to travelling, clipping or stressful situation. Administer orally via syringe. Safe to use on a daily basis. There are currently no questions for Net-Tex Calmers for Horses - be the first to ask one!